BBC Two - Obesity: How Prejudiced Is the NHS? Professor Rachel Batterham explores whether there is 'fat prejudice' against obese patients within the NHS that is stopping them accessing potentially cost-effective surgery. Britain has a serious problem with obesity - and the medical cost is threatening to bankrupt our health service. 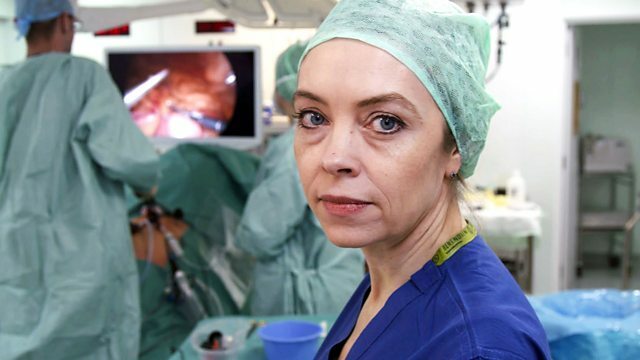 Professor Rachel Batterham, head of the obesity services at University College Hospital and a research scientist, presents this current affairs documentary. In it, Rachel explores whether there is 'fat prejudice' against obese patients within parts of the NHS that is stopping them accessing a potentially cost-effective surgery, even when recent scientific research supports it. Professor Batterham considers obesity to be a disease that needs specialist treatment, including weight-loss surgery, whereas many others contend that it is a lifestyle choice. She meets several NHS patients who say they were made to feel 'not worthy' and were denied life-changing bariatric surgery and other routine operations. This seems to show evidence of a bias within the health service. She also speaks to others who have tried to use the NHS weight management services, with one admitting it actually made her gain two stone. Professor Batterham speaks to bariatric surgeon Chris Pring and people that have had weight loss surgery to examine the dramatic effect gastric bypasses can have on person's lifestyle and overall health - and how it can even cure other weight-related illnesses. Rachel also meets patients who are successfully using the diet and lifestyle programme called Tier 3 services, which the NHS require them to do for two whole years before being considered for surgery. Could weight-loss surgery actually be a more cost-effective method of treatment for the NHS?